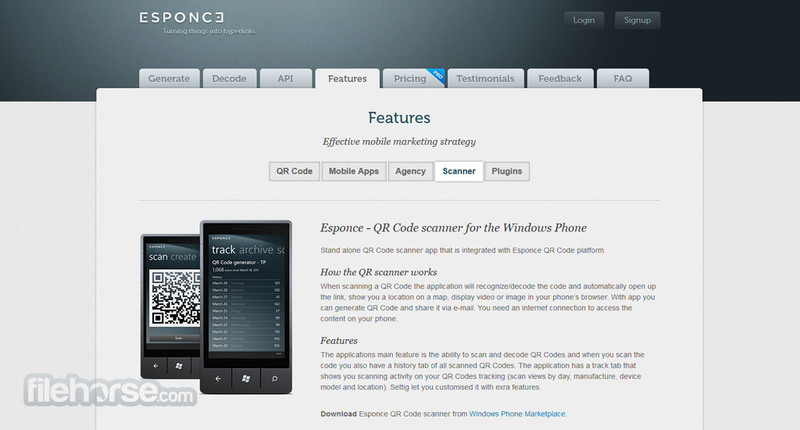 Esponce QR Code Generator for the users that want to create modern mobile marketing platform without any compromises. It can not only create QR Codes, but also track their usage, integrate into mobile aplications, professional large scale projects, and enable you to expand your business on all modern platforms. With Esponce QR Code Generator, your real world marketing campaigns will never be the same. Try it out. QR codes have the information embedded into the code and the information displayed on your mobile screen when the code is scanned is dependent on the QR Code reader the user has installed. Branding QR codes allow you to brand codes such as a vCard, vEvent, Geo location and map, text, e-mail, phone number, SMS and so on. Metrics of QR Code scans give back essential information of how good a QR Code campaign has performed in the real-world. You can track almost all QR Codes, but one of the coolest things is that now you can also track local non URL codes. Overview of where your customers are coming from. All QR Code scans are date and time located on an interactive zoom able map. Location is graphically presented and broken down to Country, state and city. Tracking of your local QR Codes such as a vCard is easy now. Furthermore you can track all local codes: GeoLocation & maps, Text, E-mail address, phone number or SMS QR Code. The name “Dynamic” for this type of QR Code is very appropriate. It has a dynamic component which means that the user can simply change the QR-landing page anytime after the QR Code has been printed on the product, poster, etc. QR Codes can be designed adding images (logotype or a white box). When creating such a code you need to know that the process will take part of the QR Code away but the QR Code will still remain readable. The only thing that changes is the version (density) of the QR Code to compensate for the missing squares covered by the logo or box. The vector EPS format provides press ready scalable graphics in a 1-color black separation for the highest quality commercial printing. This eliminates rich-black registration issues, and enables the maximum output resolution. EPS codes are fully compatible and ready to use with professional graphic arts applications and prepress workflows. Creating QR Codes for a few hundred or more products can be a time consuming task. 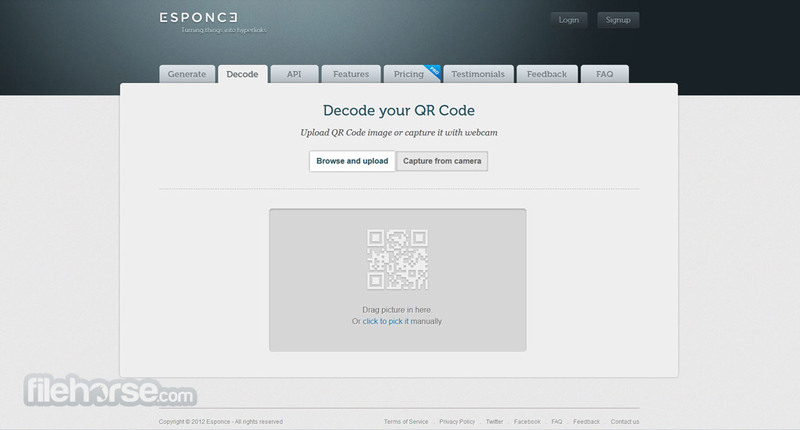 For web and offline store owners, Esponce supports easy way to create bulk QR Codes from XML files. 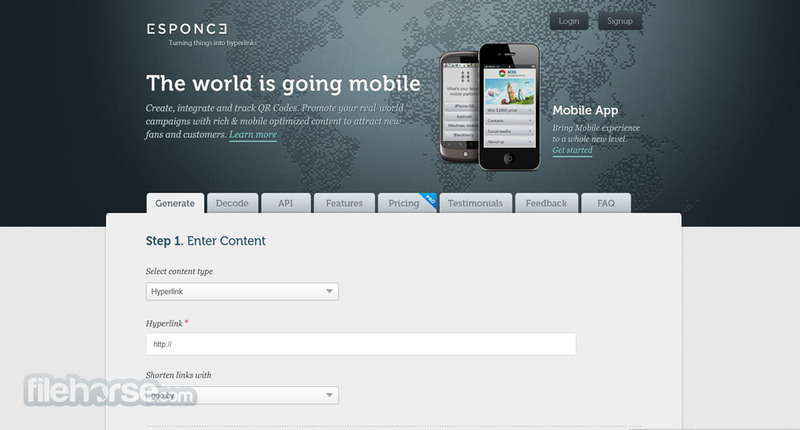 Export your products to an XML file and upload it or specify a URL to your XML and collect your QR Codes. Some smart phones already include a QR scanner by default while others require a third party application. QR Codes are usually scanned by smartphone QR reader applications and they are (in most cases) free to download. Visit Android, iPhone, Windows market place to grab one of these.